Please read this carefully --- Action is required. As of January 1, 2013, ICANN requires all accredited registrars to verify their new contact information. You can read about ICANN's new policy. 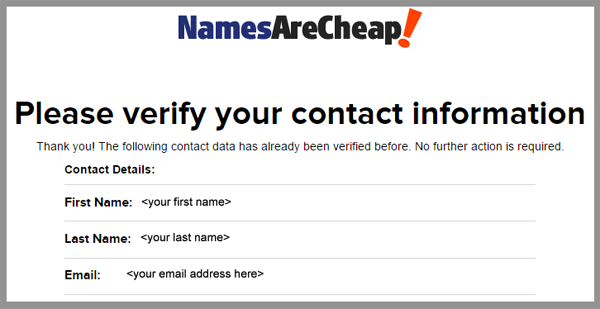 When you modify your domain name(s) contact information, please expect to receive an email called "Namesarecheap.com VERIFICATION REQUIRED - verify your domain(s) as soon as possible"
Although, we think it is bad practice to click links in emails, unfortunately ICANN, the governing body of all registrars think otherwise. 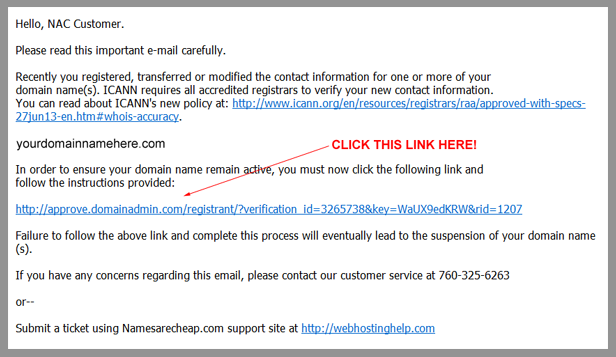 So to avoid domain suspension, you will need to verify your details by clicking the link inside this email. Below you will find what these emails look like.